Since its first publication as La Vie et l'Amour d'une Femme (Actes Sud, 1982), French soprano Régine Crespin's enchanting autobiography has been cherished as a classic of artistic biography and women's literature. Now, thanks to a grant from the French Culture Ministry, the revised and expanded 1997 version has been translated for English readers to enjoy. Crespin's book opens with an idyllic Provencal childhood, filled with sensual heat and light, the perfume of food, flowers, and flesh. She was close to her Italian grandmother Mannolini. They would sing ribald songs together, before Crespin knew the meaning of the words. Her father was a handsome, jealous Mediterranean who opposed his daughter's singing. It took Crespin years to overcome her Electra complex. Her mother was remote, frustrated, and often drunk. "Among the people of the Midi, tenderness is something shown on special occasions ... But give a little kiss on the neck or take someone's hand? Out of the question; too embarrassing." Thus Régine Crespin grew up with an emotional need that no mortal could ever fulfil. Her life was a succession of encounters with magnetic men and women who promised, but failed, to fill her inner void. At the Conservatoire she admired men, but there was always some problem. Her father interfered. One of her prospects was stolen by a homosexual (gay men were later among her closest friends). Crespin briefly sought consolation in another woman's arms. Finally, father figure Edmonde Carrière, 25 years her senior, took her under his wing, while her career moved from the provinces to Paris. Her Kundry in Bayreuth in 1958 was her breakthrough. She had an abortion, left Carrière, married Lou Bruder. They lived together for 11 years until she tired of his brutal sensuality and womanizing. She was still shy, maladroit: 30 before she dared ask for affection, 35 before she went out dancing, 40 before she had a real friend. Striking out on her own after Lou, she fell in love with Victor-José, a charming Argentine. He wouldn't, or couldn't, reciprocate. Her therapist discovered he was a repressed homosexual. They remained friends. She had a four-year affair with African-American conductor Henry Lewis, himself on the rebound from Marilyn Horne. Lewis had unresolved racial complexes, demons which Crespin couldn't understand. They parted amicably. Cancer struck. Two horrible tumours. She underwent a hysterectomy and later had chemotherapy and Curietherapy for breast cancer. The radium needles stuck out of her breast for two days. After that, she wouldn't allow men to touch her. She devoted herself to friendship, to teaching, and to reading. She wintered in Senegal, wondering about the afterlife and life on other planets, dabbling in Buddhism, phytotherapy, astrology, reflexology, all the pastimes of a lonely, idle woman in retirement. 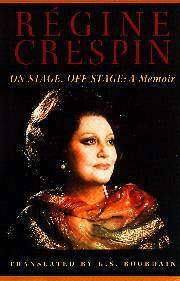 Crespin had a superb voice, a great career, and a tragic personal life. This book is the logical conclusion to the therapy she began after Victor-José. It is a talking cure ‹ utterly frank, modest, funny and non-judgmental ‹ in which she finally resolves the conflict between Régine, her inner child, and Crespin, the Diva. P. A. The sleek layout and insider attitude of The Rough Guide to Opera is well-calculated to get smart beginners excited about the art form. The book is divided into eight chronological chapters covering 132 composers, some rather minor. Each chapter introduces a musical style or period in intelligent but accessible terms. Each composer is likewise described and situated in his/her artistic and historical milieu. Each composer's major works are described, including dates of composition and premiere, librettist's name, and a plot synopsis. All this leads up to the "buyer's guide" CD descriptions. The CD listings are far from exhaustive (only 3 Toscas and 2 Normas out of the dozens available!) but they are reliable, mentioning the best commercial recordings. The CD advice generally echoes the Penguin and Gramophone Guides but stops around 1996. Thus, for example, the two new French versions of Cherubini's Medée are not included. The Rough Guide has a very welcome modern opera section full of information not easily found elsewhere. The book's appendices include thumbnail biographies of singers and conductors (more singer discographies would be helpful), a directory of opera houses (but not enough website adresses), and a glossary of operatic terms (a compact disc demonstrating these confusing terms would be a valuable addition). The Guide's no-nonsense style is neither technical nor vulgar. If you want to know a lot about opera fast, but resent the "For Dummies" approach, this is the best new book on the market to bring you up to speed. P. A. Le Seuil / Solfèges, 1998, 2e édition. 187 pp. Ce livre, paru une première fois en 1958, se compose pour l'essentiel d'une biographie du compositeur, au texte entrecoupé de nombreuses illustrations et complété de diverses annexes, dont (1) des citations extraites de sa correspondance, (2) une chronologie de ses oeuvres, (3) une « bibliographie succincte » et (4) une analyse musicale assez détaillée de La Traviata. Une fois encore, on a préféré faire disparaître la discographie que comportait l'édition originale plutôt que de se donner la peine de la rafraîchir. Quant à la bibliographie, on constate qu'elle ne contient aucun titre postérieur à ... 1962! Hélas, de façon générale, c'est tout l'ouvrage qui a beaucoup vieilli. Ainsi, les deux pages d'introduction (pp. 4-5) où l'auteur peste contre les musicologues français pour leur mépris supposé des opéras de Verdi dégagent une odeur de polémique moisie. D'autres passages nous font mesurer l'évolution des moeurs depuis les années 50, par exemple la suggestion, formulée (p. 29) au sujet de la liaison entre la Strepponi et Merelli, selon laquelle « les chanteuses d'opéra ont toujours dû accommoder leur genre de vie avec certaines nécessités ». Sans doute certains directeurs de maisons d'opéra peu scrupuleux continuent-ils de s'arroger un prétendu « droit de cuissage » sur les jeunes chanteuses, mais ce genre de comportement n'est plus, définitivement plus, considéré comme normal ou acceptable. Mais ce qu'il y a sans doute de plus vieillot dans ce livre, c'est le caractère excessivement «hexagonal » du propos. D'une page à l'autre, il est constamment question de la France : Verdi et la France, la France et Verdi ‹ la relation est examinée sous toutes les coutures et magnifiée jusqu'à un point qui confine à l'absurde, comme lorsque l'auteur essaie de nous faire croire (p. 121) que Don Carlo a été composé sous l'influence, non de Wagner (comme on le dit souvent), mais de ... Gounod! Since its first publication in 1977, John Ardoin's The Callas Legacy : The Complete Guide to Her Recordings on Compact Disc has been every opera queen's bible and the definitive guide to the Callas discography. The fourth edition is a virtually intact reprint of the third edition. The only new entry is the 1953 Barbirolli Aïda (Legato CD 187), discovered in 1994. Elsewhere, Ardoin criticizes EMI's 1992 "Maria Callas Rarities" compilation, which apparently didn't contain all the promised rarities. Ardoin has also cut 9 superfluous lines to maintain the same pagination and indexing as in previous editions. He includes a couple of snippets about Callas rehearsal tapes from the 1970s. Since EMI has re-released every scrap of Callas from their archives (and licensed a couple of pirated operas), and now that Gala and Opera d'Oro are selling Callas pirates at budget price for the first time in history, this book becomes even more indispensable. But if Opera d'Oro's deal with the Callas estate to release 20 previously unavailable pirate recordings really happens, then an updated fifth edition of the Callas Legacy can't be far away. P. A.
Amadeus Press is distributed in Canada by Cavendish Books, Inc., Unit 3, 801 West First Street, North Vancouver, British Columbia V7P 1A4. Tel: 1-800-665-3166. Fax 665-3167.